A Map of North America Constructed According to the Latest Information by H. S. Tanner. 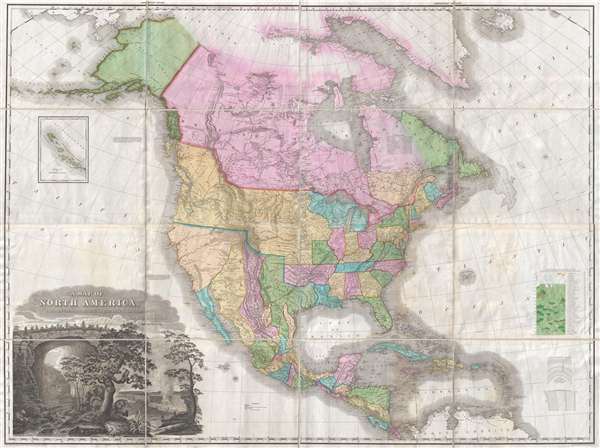 An attractive example of Henry Schenk Tanner's remarkable 1825 landmark map of North America, considered to be the most important map of North America of the 19th century. Revolutionary in countless ways, this is the most accurate map of North America, in particular the unexplored western parts, the world of 1825 had yet seen. The task before Tanner in assembling this map, piecing together the cartography of an unknown country from piecemeal, often unreliable reports, was monumental to say the least. Tanner draws on Aaron Arrowsmith, Lewis and Clark, Alexander von Humboldt, Zebulon Pike, Stephen Harriman Long, Daniel Williams Harmon, George Vancouver, and others. The map is broad in scope, cover from the high arctic and the Bearing Strait to the northern part of South America. It includes all of North America, from Alaska to Panama, including Greenland, Iceland, the West Indies, Central America, and the Aleutian Islands. The United States is presented according the pre-Mexican American War boundaries. British Columbia, called New Hanover is tied to the massive Oregon territory as far north as 54° 40' Latitude – a claim that would later become an issue of international contention. The United States boundary with Mexico follows the 1819 Adams-Onís Treaty and runs along the Sabine River to the Red River, to the 100th Meridian West, to the Arkansas River, then west to that river's source at the 42nd parallel which it follows to the Pacific. These Mountains are supposed to extend much farther to the north than here shewn: but there are no data by which to trace them with accuracy. Instead Tanner follows earlier conventions and unreliable monastic reports by adding three fictional rivers, the Rio San Buenaventura, flowing from Lake Utah, labeled here Salt Lake; the Rio Timpanagos, flowing from Great Salt Lake, labeled here Lake Timpanagos; and the Los Mongos River, also flowing from Lake Timpanagos. Tanner funnels the Timpanagos River into San Francisco Bay, labeled here Port Sir Frans. Drake, which is, for all intent and purpose, unrecognizable as Vancouver, his primary source for the west coast, never explored the Bay Area. The cartographer identifies a hypothetical 'Great Bear Lake' just east of Prince of Wales Island. This is not to be confused with the factual 'Great Bear Lake' correctly located to the north of 'Great Slave Lake.' Apparently this, along with much of the other information about the Pacific Northwest was derived from the 1820 journal of Bennington, Vermont, native, fur trader, and explorer with the Northwest Company Daniel Williams Harmon (February 19, 1778 – April 23, 1843). Harmon himself never saw the supposed lake, but rather noted it in his journal based upon representations by Native Americans he encountered trading fur. In the lower let quadrant there is a dramatic title cartouche featuring some of the flora, fauna, and natural wonder of America. Niagara Falls and the impressive Virginia Natural Land Bridge are prominent. The picture of Niagara is a combination of Vanderlyn's 'A View of the Westerly Branch,' used for the Horseshoe Falls portion of the image, and the left part of his 'A Distant View of the Falls of Niagara,' used for the American Falls portion of the image. In the foreground some of the more important New World fauna, the beaver, a stag, and a bear, are presented. The cartouche does much to capture both the wildness and rich natural resources of the North American continent. This map was first issued in 1822 and the copyright here reflects that date. There were 4 subsequent states, each with only minor updates and revisions. This is the fourth. State 1. First edition Does not include Franklin's Gulf in the Arctic or the 1824 Russian Boundary. State 2. Franklin's Gulf added. State 3. 1824 Russian boundary and 'Improved to 1825' added to title. State 4. 1825 boundary in the far northwest. It was issued in the 1825 printing of Tanner's New American Atlas. Tanner's map went on to have a lasting influence on American history and cartography, even long after it was outdated. The Disturnell map of Mexico, Mapa de los Estados Unidos De Mejico, used to the Treaty of Guadeloupe Hidalgo, for example, is based heavily on this map. The map was also used in the Alaskan Boundary Tribunal of 1903. Very good, near flawless example. Rumsey 2755.007. OCLC 11440047. Wheat, C. I., Mapping of the Transmississippi West, 1540 – 1861, #350, Vol 2, pages 82 - 87. Ristow, W., American Maps and Mapmakers: Commercial Cartography in the Nineteenth Century, pages 191-198.